Momma of Two Review: The Classical Historian - Learning Made Fun! The Classical Historian - Learning Made Fun! I like to think that I take an active role in the education of my children. The truth is, my son (and someday my daughter) will spend 6 hours a day, Monday through Friday, from September to June, in school, being taught by a professional. I give credit to all of the teachers in the world because I know for certain I could not do what they do day in and day out, and still have hair, my sanity or my sense of humor at the end of the school year. I also think that teachers, including parents who Homeschool, deserve more than just a day or a week to honor the job they do. While I choose to send my child to public school, I still like to take part in his education, and consider myself to be very involved and in-tune with his performance from an educational standpoint. I am a member of the Mosaic Reviews Team (see my badge), and am lucky enough to use and review material that is aimed towards families who Homeschool. As stated before, I do not personally Homeschool, but plan to use the material I get chosen to review to support and encourage my son's (and eventually my daughter's) learning. Additionally, one of the most magical things about being a parent is being able to witness the whole learning process firsthand. From the day your baby puts the right shape in the top of the shape sorter to the day they write their first essay (to the day they graduate), it never gets old! One thing I struggle with, when it comes to bringing education into the home is making it fun and exciting. I walk away from parent-teacher conferences and report cards knowing areas we should be focusing on, but lack a way to do it that will not send my son running for the hills. 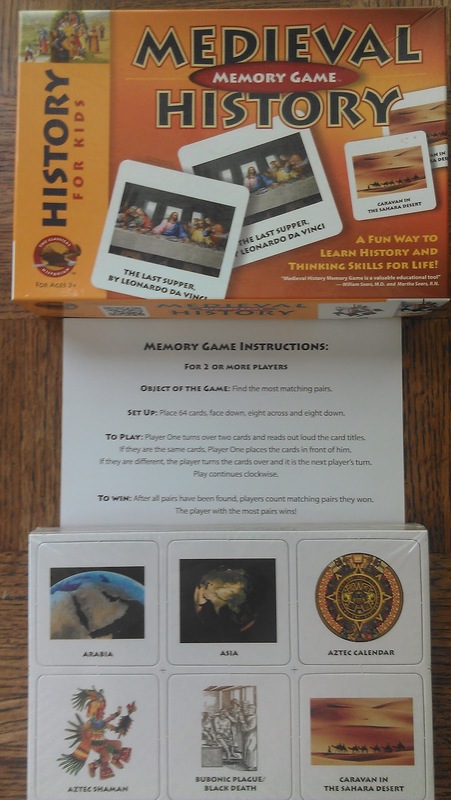 Enter in, my latest review: The Classical Historian Medieval History Memory Game! The Classical Historian provides enticing products for families who Homeschool (and those who don't too!) from curriculum material, to textbooks to DVDs and games. On top of that, their products can be used from the time your child enters Kindergarten (and even earlier) to the time they graduate high school. You can see all they have to offer here. They currently have a free Summer lesson plan to use that focuses on Independence Day which you can see here. You can also "like" them on Facebook here to keep up with any new and exciting products or updates. There is nothing to dislike about this set! I love the quality of the product; the cards themselves are very sturdy (i.e. they will last a long time), the pictures are bold and colorful (i.e. they grab the attention of even the younger players), and there are a couple of different ways to play (i.e. the game has longevity). While this set is a bit more expensive (the cost is $14.95) than the traditional memory-type games you can grab at your local store, the benefits make it worth every penny. My favorite quality of this set is the versatility. There is nothing more wasteful to me than spending money on a product that serves us for only a short while. I am always buying clothes a little big, toys that can "grow" with age, etc... First and foremost, this set comes with 64 cards. You can choose the number of card matches to play with, with less (and simpler ones) for younger kids, and more for the older kids and when playing with several players. Second, this set is educational. Whether the child(ren) are just familiarizing themselves with the concepts present during the Medieval Times, or older children being able to define the terms and happenings, this works for all ages. And last (but certainly not least! ), there are two ways to play the game. 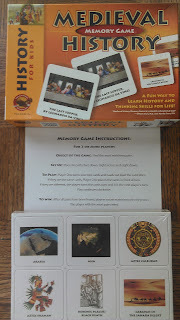 There is the traditional matching game where all of the tiles are placed face-down and players take their turn flipping over two at a time to find matches, or, you can take it up a notch to the categorization version of the game where one player is timed while they find their matches, and place them under the correct categories (i.e. Europe, The Americas, Far East and Arabia). This makes the game relevant up to the high school level and beyond, meaning it has many more years of use in my house. It also has the benefit of refreshing our memories, as adults, as we play this fun game with our children! My son loving his new game! We really loved this set, and I give it 10 stars!